Do you want a sneak peek into one of the most anticipated paleo cookbooks of the year? Do you want a glimpse into what the dynamic duo of paleo have been up to these last few months? Of course you do! George Bryant and Juli Bauer have been kind enough to let me share a recipe from their upcoming cookbook, The Paleo Kitchen. And it's no surprise that this recipe for Ginger Snap Pumpkin Butter Cookie Sandwiches is fantastic, since we all have come to expect nothing less from these two paleo masterminds. Everyone I know has already pre-ordered The Paleo Kitchen, so wipe the drool off of your chin and make sure to reserve your copy now before they sell out. And while you wait patiently for your book to arrive, you can enjoy some of these fantastic cookies (and feel free to make some for me if you like, I wont mind at all). Preheat the oven to 350°F (175°C). Line a cookie sheet with parchment paper. Combine the almond flour, coconut flour, baking powder, cinnamon, ginger, and salt in large mixing bowl. Whisk together to evenly distribute the ingredients. Add the coconut oil, maple sugar, vanilla, and eggs and beat or mix until a dough has formed. Dust work surface with almond flour and lay the dough out, pressing it down until it is about ½ inch (12 mm) thick. Using a cookie cutter, cut the dough into circles. No cookie cutter? Use a lid to a spice jar or small mason jar. This should create around 40 small cookies. Place about 20 of the cookies on the prepared baking sheet, about ½ inch (12 mm) apart and bake for 5 minutes. Immediately remove the cookies and place on a rack to cool. Repeat with another batch of 20 cookies. While the cookies cool, make the pumpkin butter. Place the pecans in a food processor and puree until smooth. Then add pumpkin puree and maple syrup and puree until well combined. Assemble the sandwiches: Spread about 1 tablespoon of the pumpkin butter onto a cookie and top it off with another cookie. Then use a spoon to drizzle a bit of chocolate over each cookie sandwich. Store in an airtight container in the refrigerator. These will keep for about 3 to 4 days. 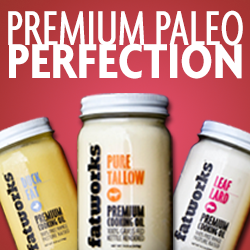 Order your copy of The Paleo Kitchen today!